The Christmas spirit was a little delayed here in our household this year. With the amount of orders my studio had and my lack of energy due to a little bun in the oven, the decorations took a bit longer to get up. I didn't put out everything I usually do, just some of my favorite things. When we were first married, we made a rather expensive purchase on a sentimental nativity scene. I have fond memories of setting up and playing with my childhood manger. So I knew I wanted to get one that had a story and that we could pass onto our kiddos. However, this nativity scene is not "kid friendly". Oops, wasn't thinking that 9 years ago. We purchased it from an elderly man with Alzheimer's from his quaint studio in Maine, were my hubby and I met. I had my eye on it for years and we finally bit the bullet. 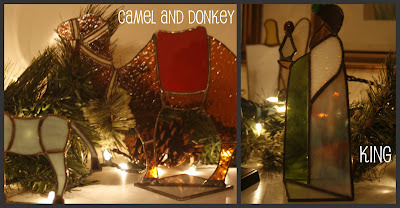 to tablecloths, salt and pepper shakers, artwork and in particular Christmas ornaments. When we were first married, we didn't have many ornaments besides the hammy downs from Matt's childhood. We had the typical cookie ornaments, nursery school crafts, and a collection of tacky crystal angels and snowmen. I knew I had to add to these, so went to a local antique store and stocked up on some vintage balls. Some have broken since then (insert sad face) due to a fallen tree in our first apartment, but most are in tact. 4. A garage sale find... love these little people! 5. I try to buy an ornament from each place we visit. This one is a Murano glass ornament from Italy. 6. The ugliest beaded ornament from Matt's childhood. It always makes it's way to the back of the tree. 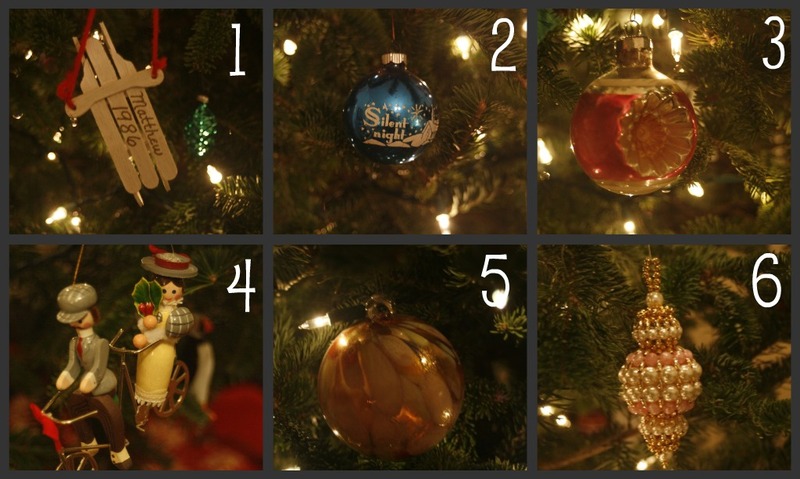 Those are just a few of my favorites that decorate our tree! I have collected over the years. I love those big vintage lights, but don't have the guts to string my house with them. So instead of outside, I use the bulbs as a centerpiece on my dining room table. 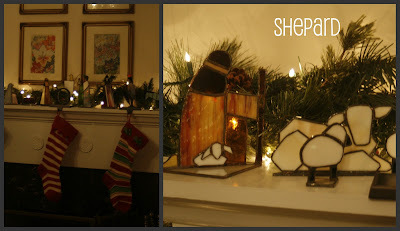 The stockings are a fave of mine that I found for $2.99 each from Christmas Tree Shoppes. The salt and pepper shakers were a gift from the hubby a few Christmas' ago...I LOVE them! We both love nutcrackers so our collection grows each year. I think we need to slow it down a bit because our small little cottage can't handle my collecting obsession. 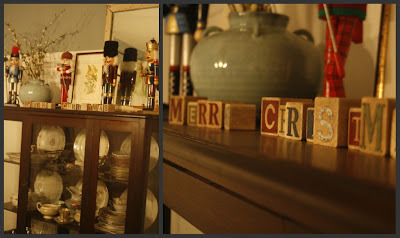 The vintage blocks with Merry Christmas on them is a 'must put out' decoration, just too cute to keep in the box this year. There's a short tour of my home this season. Looking forward to heading down to Philly to visit my family this Christmas. Have a blessed Holiday everyone! Check back for my attempt at peppermint bark and sea salt caramels! Lovin' #4 on your ornament list, and the ugly beaded ornament, too.